… wear green, drink green …. Pwera nalang dugo ko .. hindi green lol. I admit, I might be a candidate to contracting colon cancer in the future, knock on wood! I just wished I can have my DNA drawn so I would know at what age will contract one, so I can sequence doing the things I’m supposed to do.. haissst… what am I talking about … sorry for this post again but I’ll be talking some sort of a pong thing here.. I admit, I have this constipation disorder, according to the doctors, marami na kasing opinion .. just the paranoia of me, lol, para masigurado, it’s not about my diet since I’ve switched back to basics long time ago, been eating like a goat for quite a time now…. The doctors said … its stress! Haisst… What can I do? If I leave this place and bring all my kiddos out.. ako yung masama, If I leave alone, mas ako pa rin yung masama, If I ask my husband to leave and come with me, walang utang na loob na anak iniwan yung nanay na nag-iisa, Haisst, want to get out of this rotten culture.. geeee… sorry I got carried away .. Anyway, as a band-aid solution I’m into green drinking as in wheat grass drinking, I think it helps, not if I see my MILs face, waaaaaaaa! If I’m in the mood of preparing I use the fresh ones just throw it all in the blender and gulp it down, but often ended up with this one, sa katamaran. 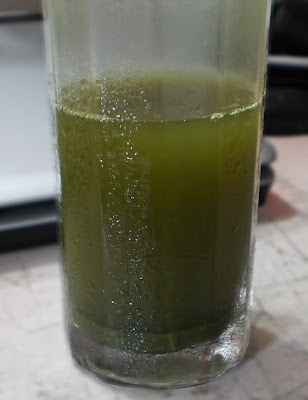 According to research WheatGrass offers so much in terms of detoxification, including my brain … lol. You can Wiki it or google it whichever you desire. Tata, that’s my green mind este post for todays GT at K’s. ahm ^_^ i don't know what to say teacher vernz out of words yata!! hahaha!!! lami na te? lain au ang color hehehe..
you're in a very hard situation, sis. stressful indeed. pwede din ba madetoxify ng wheat grass ang green minds na kagaya ng sa akin? ehehe. seriously, i haven't tried that. masarap ba yan? nga pala, my entry is here, sis. masarap ba yang wheatgrass na yan? di ba parang lumulunok ka ng damo?? hehehe.. ako nga rin need to take lots of fiber, kasi may diveerticulosis ako, katakot mga colon problems na yan noh? my father died of colon cancer, kaya nagpa colonoscopy ako at age 36, normal naman, but u know, iba na ang sigurado di ba? hehehe! this is a very informative post. where tau maka avail ng wheatgrass sis? you know it's also very very good for hyperhidrosis (excessive sweating)! I've been searching all over my place (UAE) I can't find one! padayon lang sis, it's nice for your health, visit my entry too: Green Christmas!Tnx. wow! you are such a healthful eater.Gud lak na lang sa akin kung kaya ko yang gawin! agoy kung moinum ko ana d lang nako tan-awon...ehehehe....mura man jud ug...ayaw nalang...ehehehe...lami bana sya te? ehhehee! agoy d jud mo friendship ni MIL da...ehehehe...mau gani kay d nya basahon imong blog...lol! You look beautiful! Hindi ako kabisado sa green drink mo. May lemon taste ba yan? Girl, ako din eh madalas din akong ma constipate hummm saan mo ba ito nabibili? green tea, that, i can handle... green wheatgrass? that got me curious! 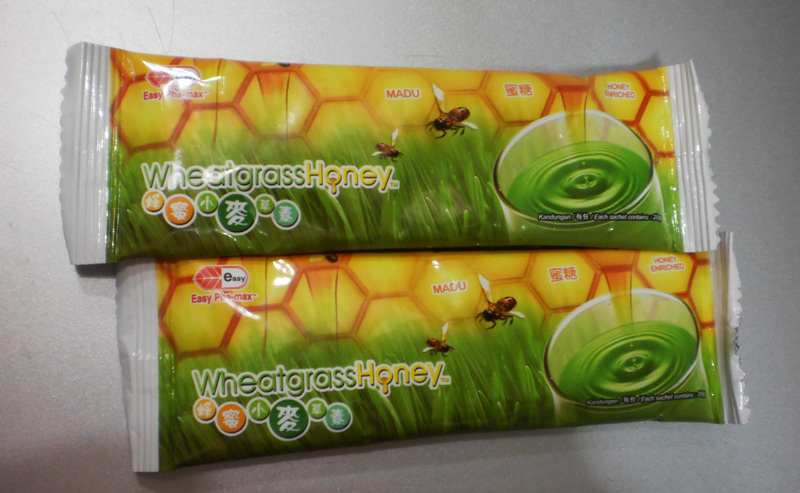 I've seen something like that in SM and seriously I'm so curious about the taste of wheatgrass but I don't have the courage to try, lol! Anyways, you really sound STRESSED.. try to unwind, girl! ano ba lasa ng wheat grass, nakaka curious kc, with the stress factor nmn, siguro gawin mo n lng pag me narinig kang di maganda, pasok sa kanan tenga tpos labas n lng s kaliwa, sometimes mahirap talaga kalaban stress, pero nasasa yo na din yan how you take it. 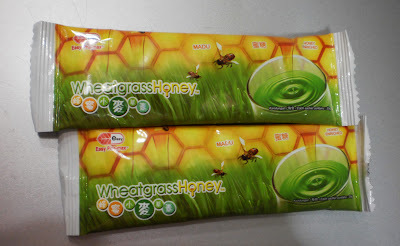 i haven't tasted wheat grass and i don't know if i will have the guts to taste it. LOL. afraid ako sa green things na niblender, save for avocados. wahaha! halatang magkasundo kayo ng MIL mo,sistah Vernz lol!Green tea would also be a big help to fight stress dear.Wag mong masyadong pansinin si MIL-magkaka-wrinkles ka lang dyan..
sis is that you in the pic?